Jill recently received a Flinders Foundation Health Seed Grant for the world-first trial, which aims to stop costly gastro outbreaks sweeping through schools, aged care facilities and hospital wards. 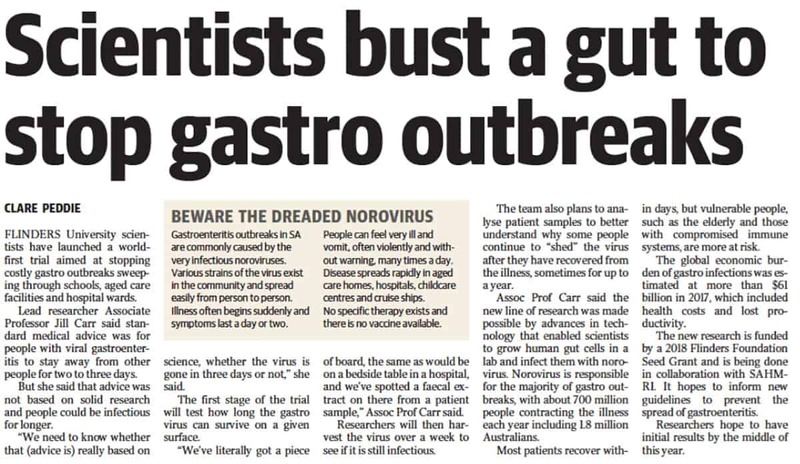 Human norovirus causes rapid onset and explosive vomiting and diarrhoea, with an estimated 1.8 million cases in Australia each year. The Advertiser wrote a story on Jill's work that appeared in the newspaper on Jan 31, 2019, you can read the story below and find out more about Jill's research project here.